This book then shows you how to advertise and sell your products or services on the Web. Learn the basics of online selling and some of the challenges facing online merchants. Find out how to use the Web for your market research and how to prepare your Web marketing plan. Learn about the importance of selecting a suitable domain name and what's involved with Web hosting. Take a look at Web authoring software and then find out how to make your site user-friendly. Take a tour of inexpensive software which you can use to establish your own e-commerce Web site. Most of these are easy-to-use solutions that don’t require any programming knowledge and can get you up and running in no time. Take a look at the challenges of integrating your back office and accounting systems with your e-commerce software. A full chapter is devoted to hints on how to fine-tune your Web site and make it e-commerce friendly. Chapter 1 - Congratulations on Wanting to Start Your Own Business at Home! Chapter 10 - Global Reach–Sell to the World! Chapter 12 - What do We Mean by Web Marketing & E-Commerce? Chapter 13 - How Much Business is Being Done Over the Web? Chapter 18 - To Host or Not to Host? Chapter 30 - What's it Going to Cost? Chapter 31 - Do You Have Enough Money to Start Your Own Home-Based Business? 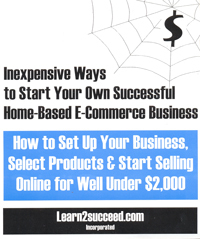 Inexpensive Ways to Start Your Own Successful Home-Based e-Commerce Business by: Learn2succeed.com Incorporated 328 pages, ISBN 978-1-55270-203-1 softcover; published in 2005; $39.95.